If you’re using Stripe or PayPal Pro, we’ve added the ability to collect credit card details directly from your sign-up page (or widget if you’re using a 3rd party website). Deposit vs. a Registration Fee: A deposit is a sum of money placed in the Family Account that will be applied towards future lessons or materials (a balance remaining/credit). A registration fee is a sum of money charged to a family for enrollment. A registration fee is generally used to offset the administrative duties related to enrolling a new student. 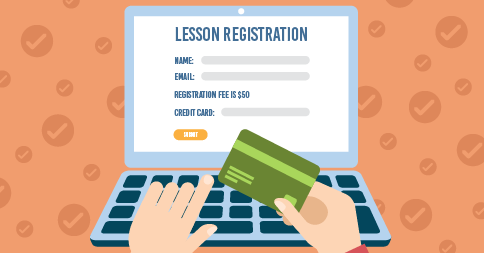 A registration fee will not be used towards a student’s lesson, it is simply a charge on the Family Account. Convenience Fees: If you’re collecting credit card details, then the registration fee or deposit will be charged automatically. The convenience fee is NOT applied because the user doesn’t have an option of paying any other way. When collecting card details on sign-up and charging a deposit or registration fee, it is recommended that you add messaging to the registration page notifying the parent that a deposit/registration fee (specify the amount) will be charged to their credit card when submitting the form. If you are using the “Auto-Active” feature, we’ve fixed an issue that would prevent non-adult students from getting their passwords (prior to this change, only parents of non-adult students would receive a login password right away). We’ve added the ability to change the order of cards/bank accounts on file that is stored in a Family Account. This allows a family using auto-pay to set the preferred sequence of cards to be charged (we’ll go through them in order until a charge succeeds). When viewing a student’s details and you switch active students (using the drop-down list at the top of the page) the current tab remains active for the new student. This makes it much easier if you’re comparing (for example) the rep or practice logs between two students. This behavior also applies to the Family Account page (and the Teacher Details page if you’re a multi-teacher school). Did you know? We’ve added the ability to set an expiry date for make-up credits. This feature is available on the School Settings page on the Policies tab. Now you can set make-up credits to automatically expire a certain number of days after the absent event.